I grew up in the restaurant business in San Francisco. My uncle was the owner of Lafayette Coffee Shop, which originally opened on Hyde Street in 1925. Through college I helped out at the restaurant, and also supported myself by working as a waiter and cook’s helper at other Chinese and American restaurants in the City. When I was 30, I met my wife at the Lafayette Coffee Shop where she was working as a waitress 16 years. It was love at first sight! We now are happily married with two children, a 6 year old boy and a 2 ½ year old girl and are raising them in San Francisco. When my uncle decided to retire in 2006, he gave the restaurant to my wife and me. 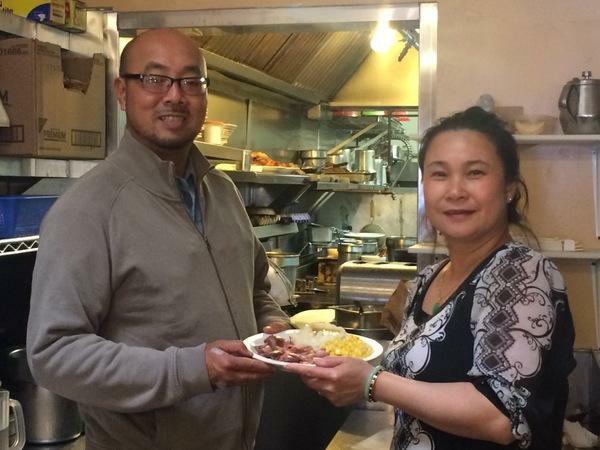 He wanted us to have the restaurant because knew that we were committed to keeping it as a welcoming place, where people from the Tenderloin community are comfortable to relax over a good meal, meet friends, and socialize. We have fulfilled his dream and have operated the restaurant with love and care. Three months ago, we were shocked to learn that our landlord on Hyde Street wouldn’t renew our lease. We were displaced!! We had to move and it would have been a huge loss for the neighborhood if we weren’t able to provide affordable meals and a friendly social space for the community. Luckily, with the help of Tenderloin Economic Development Project and other non-profit partners, we found a new location in the Tenderloin on Larkin Street and recently re-opened July 2016. Now, we are starting over again in a new location. However, we lost quite a bit of money in the move since according to the lease, anything attached to the floor couldn’t be removed so we lost most of the equipment. We also spent a lot of money to purchase the Larkin Street business and on tenant improvements. It supports a community-focused coffee shop owner looking to continue serving his devoted customers. Lafayette Coffee Shop is an old school American diner that has served the Tenderloin community for 91 years. Our restaurant is an important neighborhood institution and one of the few diners remaining in San Francisco that truly serves the community. We keep the menu as affordable as possible (most of our complete meals are under $9) and offer traditional meals such as Turkey a la King, Corned Beef, and Spaghetti with Meat Balls. We have four employees, who all live in San Francisco, and one who lives in the Tenderloin. Our new restaurant has 50 seats and is open from 7 AM to 10 PM every day of the year including holidays. Our holidays are special and very busy because single retirees and other low-income community members see our restaurant as their second home. Instead of eating at a meal program, they prefer to enjoy a cup of coffee and a good home-cooked meal at our place, where they can eat in dignity and talk to their friends and neighbors. This Kiva loan will reduce the burden of our relocation, which cost us a total of $50,000. We will use the $10,000 loan to replace equipment that was lost when we were forced to leave our previous location on Hyde Street. Specifically, we had to replace the stove and ovens in the new restaurant. We also need to recover costs for remodeling including new paint, structural renovations and renovating the kitchen. Disbursed date: Not disbursed, expired before fully funding.